The famously cute and sweet side of the Netherlands — with its canals, windmills, and tulip fields — is indeed a delight to experience. 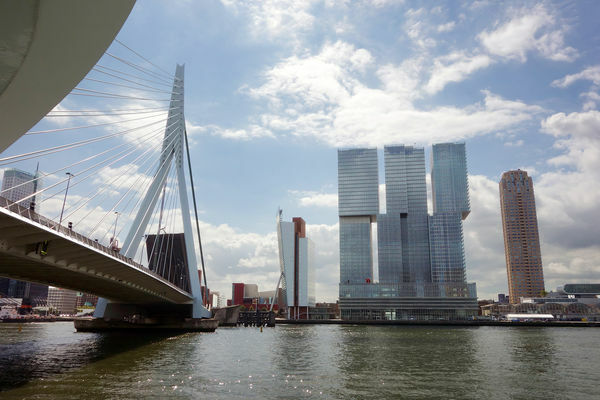 But to see how big-city modern Dutch life is lived, visit the no-nonsense "second city" of Rotterdam. Mighty Rotterdam has a gleaming skyline and Europe's largest port. Locals say that while the money is spent in Amsterdam, it's made in Rotterdam. They boast that shirts in Rotterdam are sold with the sleeves already rolled up. 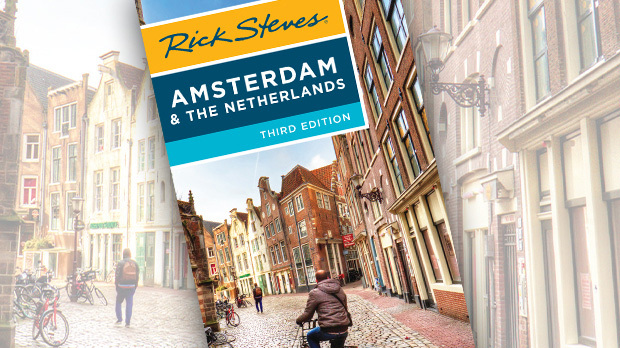 Once it was quaint and cozy like Amsterdam, but Rotterdam was leveled by the Nazis in World War II. Hitler ordered a systematic bombing of the city, and its center was, quite literally, flattened. Following the bombing, a fire raged for three days, consuming what was left. When Hitler threatened to do the same thing to Utrecht, the Dutch government surrendered immediately. Photos of WWII Rotterdam are startling: A scant few historic buildings are still standing — barely — and the outlines of the streets around them are barely visible. 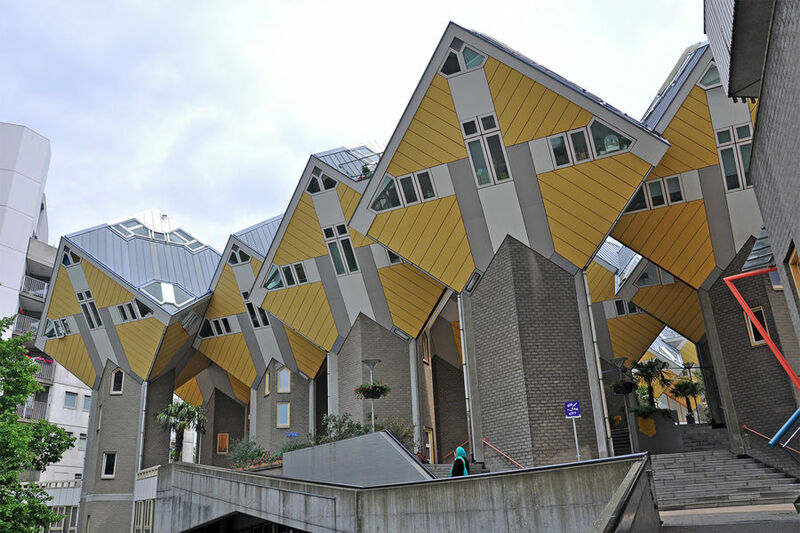 But after the war, rather than rebuild quaint (as most Dutch towns did), Rotterdammers embraced the chance to go in another direction: boldly modern. Ever since, the city has been a stimulating urban showcase of architectural experimentation, with buildings big and small designed by a Who's Who of contemporary architects. You'll see wildly creative and futuristic train stations, libraries, market halls, office towers, bridges, subway stations, and apartment complexes that push the envelope toward science fiction. In the late 1970s, architect Piet Blom turned urban housing on its ear with a striking design: 39 identical yellow cubes, all tilted up on their corners, each meant to house a single family. Taken together, the Cube Houses look like dozens of dice in mid-toss. If Rotterdam has a single icon representing its bold approach to postwar architecture, this is it. To get a look inside one of the cubes, visit the Kijk-Kubus Museum House. More arresting architecture is south of the city center, near the Erasmus Bridge, which was built about 20 years ago to link the north and south banks of the Maas River. The southern bank, then underdeveloped, exploded into a new "downtown" zone of commerce. At the far end stands a lineup of creations — nicknamed "Manhattan on the Maas" — by some of the world's top architects, including Renzo Piano, Rem Koolhaas, and Norman Foster. Their works tower over Rotterdam's harbor, the ninth largest in the world. The port handles about 30,000 ocean-going vessels each year — that's about 80 ships a day, hauling a total of 420 million tons of cargo. You can appreciate the immensity of it all with a harbor tour. You'll see the sprawling Staatspark (marked by the Euromast tower); several innovative waterfront housing blocks; and one small section of the bustling port, with stacks upon stacks of containers and a forest of busy cranes. But not everything in Rotterdam is postwar mod. One of the few well-preserved bits wasn't even originally part of Rotterdam — it was the port for Delft. Historic Delfshaven is just a short subway ride away from Rotterdam's city center, but it's a world away from the 21st century. There's an idyllic canal pulled straight out of a Vermeer painting, with old boats, a cantilevered drawbridge, and even a windmill still churning away in the distance. In the heart of the city is Rotterdam's oldest structure, St. Lawrence Church — completed in 1525 and a rare survivor of the 1940 Nazi bombing campaign. The church's nondescript exterior belies its vast, pristine interior, which sports a huge organ. If you enter, be sure to look up to appreciate its roof, one that was clearly made by a city of shipbuilders — it feels like you're huddled beneath an overturned boat. Grotekerkplein, the "Great Church Square" in front of St. Lawrence Church, honors Rotterdam native Desiderius Erasmus (1466–1536) with a 17th-century statue, which also miraculously survived the bombing. A great humanist, Erasmus forged the notion of identifying as European — seeing oneself as a citizen of the world and not tied to a single nationality. In many ways he's the intellectual forebearer of the European Union. On the pedestal, in Dutch, is an excerpt from one of his most famous remarks: "The entire world is your fatherland." Some dismiss modern Europe and its attempts at political union as a failure. I'm not blind to the fact that Europe has its flaws and is grappling — not always very well — with some serious challenges of its own. 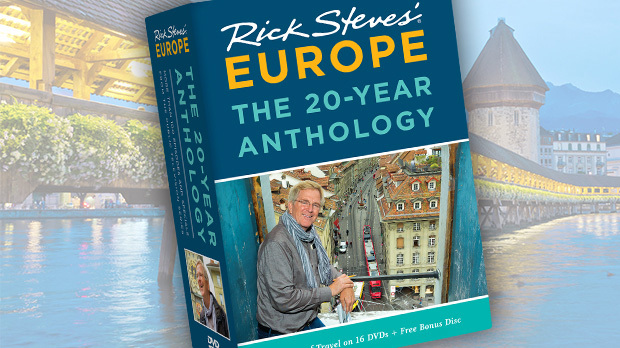 But I love the Europe of today — the one Erasmus foresaw — and a visit to his hometown of Rotterdam, rising out of the ashes of war, is a chance to witness its stunning success.